Learn how to create flowers including foxgloves, roses, hydrangeas, delphiniums, primroses, geraniums, irises, poppies... and much more. All the techniques are explained in detailed step-by-step sequences. 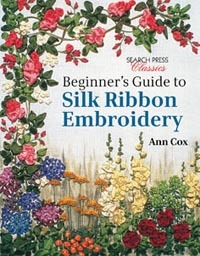 This is a best-selling, timeless classic redesigned for modern embroiderers, and is suitable for beginners and more experienced embroiderers, with clear, step-by-step instructions.